Enjoy cute, funny, best propose SMS for girlfriend, boyfriend, him and her. Get short, new, latest propose SMS quotes or propose text messages in Hindi and English for propose day, Whatsapp and Facebook. If you are looking for English propose SMS for boyfriend then we have a new and latest collection of the English SMS for proposed texts. Since I saw you my handsome, I am yours from then my handsome. Always be mine, otherwise, I will kill you my handsome. I like chess because I have to protect the king, I love you because my king will protect me. I never understand why people love until I met you, now I know why love is immortal and reside in people’s heart. The day I saw you, I am gone, please be my hero for the lifetime. You have something special in you that is why I am with you. Sweetest way of proposing boy – Will you mind growing old with me? The best way to propose – Excuse me, I lost some alphabets from A-z, and I am left with – Just marry me. I am not a strong girl to back my decisions but loving you is my firm and strong decision that I will back for sure. I love you not just because of you but because of my soul attached to you. Girl – Will you mind texting me your address?Boy – Why?Girl – Because I have found my soulmate at that address. If you are looking for Hindi boyfriend propose text collection then get the best and latest propose SMS message collection. Enjoy and share it with friends. मैं मानती हूँ की बातें बिना कहे भी समझी जाती है,पर दिल की बात बिना इजहार किये कहाँ समझ में आती है? So you got girl whom you seeing as a girlfriend, then express your feeling in a cool and creative way to propose her. Please don’t blush at least say I am your crush otherwise, feelings will get flush. I saw dreams of spending life together, Please say yes, otherwise, nobody will believe on true love and dreams. Your color is white and mine is black, let’s make a perfect combination of black and white kids. I heard every successful man has a successful wife, would you like to test this saying? Maybe I am hard and muscular but have a soft corner for you, just be my wife and glitter every corner of my life. My heart is a safe locker for you because every corner of this locker is owned by one name and it’s you. Since I saw you I forget sleeping, eating, smiling, and flirting. Just be the solution for all my problem and let me enjoy life with my wife. Being a girl you should not look for the handsome hunk but for the loving and caring hunk. Must Read: Best and cute Good Morning SMS. If you want to impress a girl with your Hindi propose quotes or text messages, then why don’t you send her a cool and new creative propose texts. Probably she will say yes this time. We have just covered funny, and best propose SMS for girlfriend and boyfriend in Hindi and English. 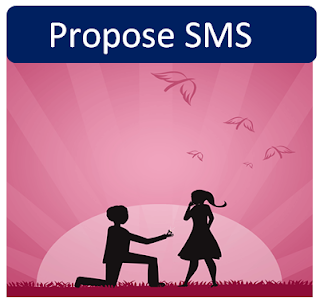 If you want to propose someone with creative propose SMS quotes then enjoy our huge collection of SMS quotes. If you liked our content then share or like us on Facebook or tweet for us. I am really excited for the upcoming Valentine's day. I want to share Propose Day status to my special person. Very nice Blog. I want to share these msg to wish a very good morning to friends, family and others. These are so good. Here are more good morning sms. Thanks!